The Vancouver Condo Buzz » From $268k! Landmark Vancouver TATE ON HOWE Condo Tower in Downtown South (1265 Howe Street Vancouver) > 41 Storeys of Exclusive TATE Vancouver Condos + 17 Artist Studios! A fabulous new project in Downtown Vancouver is launching this Fall! The preconstruction Vancouver high-rise landmark will be situated ideally on Howe Street in downtown south district and it’s brought to you by Bonds Group of Companies. The preconstruction Vancouver Tate on Howe condo tower will feature a 41 storey high-rise tower offering around 348 suites for sale with over height ceilings, oversized windows and unparalleled views. The project site is at 1265 Howe Street Vancouver and the Tate on Howe tower is scheduled for completion in early 2016. The modern glass design is by Merrick Architecture. Prominently located at Howe Street and Drake in Vancouver Downtown South real estate market, the new 41 storey Vancouver Tate on Howe condominium tower will offer studios to 2 bedroom plus den floor plans. The striking high-rise tower will also have 17 working artists’ studios and gallery space, allowing home owners and pedestrians to engage in the creativity of this vibrant and ever evolving neighbourhood. According to multiple sources online, Tate on Howe Vancouver tower is a new project by Bonds Group of Companies and will feature a 41 storey high-rise landmark building with over 325 suites for sale. The glass and steel structure will be designed by Merrick Architecture and the project site will be at 1265 Howe Street Vancouver Midtown Downtown district. The estimated completion will be late 2016 and the presale price point is expected to start from the high $200’s. Prominently located at Howe and Drake in Vancouver Downtown South real estate district, TATE on HOWE Condos for sale is a striking tower offering 1 and 2 bedroom homes in addition to the highly sought after penthouses and sub-penthouse residences with sweeping views of the downtown skyline and water. The beautiful TATE on HOWE Vancouver high-rise will feature 17 working artists’ studios as well as gallery space, allowing residents and passers-by to engage in the creativity of this vibrant Downtown South Vancouver district. An exciting opportunity to purchase a home in Vancouver’s newest urban neighbourhood called Downtown South is now here! Tate on Howe Vancouver high-rise tower is 41 storeys in height and will feature a unique, curvilinear glass and steel architecture that is designed to infuse interiors with natural light while optimizing views and privacy for residents. The presale Vancouver Tate on Howe condo tower will feature amenities that include a fireside lounge with entertainment style kitchen and library, fifth floor terrace gardens, fitness centre, yoga studio and a meeting/conference room. Make sure you register early for this one! The project site for the Tate Vancouver Downtown South condo tower is at 1265 Howe Street Vancouver. More information is online at www.tateonhowe.com. Located at the corner of Howe and Drake Street in Vancouver, this 27,000 sqft site is being developed into a 41 story residential hi-rise building with ground floor artist studio and retail space. The name of the project is Vancouver Tate on Howe. With unique architecture features including grand lobby, expansive porte cochere and elevated gardens designed by renowned architectural firm Merrick Architecture, this 339 suite Tate on Howe condo development is expected to be selling in Fall 2013. See website for details. The developer is Bonds Group of Companies and the architect for this visionary high-rise is Merrick architecture. The interior design is by award winning Cristina Oberti and the sales and marketing is by leading Magnum Projects Ltd. 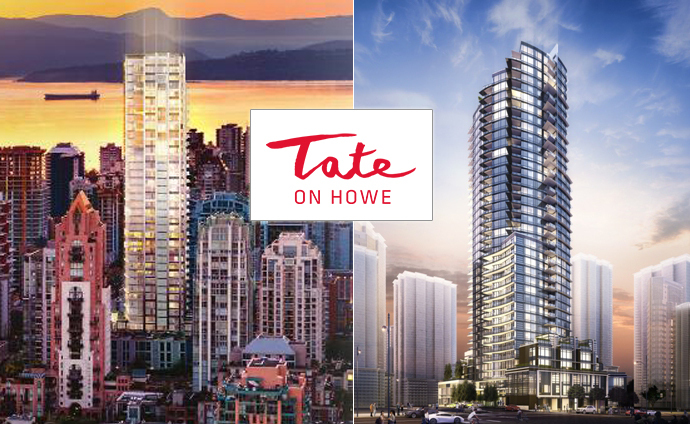 The estimated completion date for the presale Vancouver TATE on Howe tower is late 2016 into early 2017. The initial deposit is $10,000 bank draft due at the signing and a second deposit of 10% less initial deposit within 7 days of the vendor acceptance. The 3rd deposit for the TATE on Howe Vancouver condos is 10% due later of 1800 days after signing due later of BP Amendment to Disclosure. The Vancouver Downtown South neighbourhood is undergoing incredible revitalization and is being dubbed as the new city core centre. In addition, it’s within walking distance to downtown Vancouver’s most impressive sites including Yaletown, Robson Street, entertainment district, beaches, marinas, Stanley Park and much more. YVR is also within reach along the Canada SkyTrain Line. With amenities that are unmatched by any other downtown high-rise, the Vancouver Tate Clubhouse captures the essence of an elite private club. The Tate Clubhouse boasts an unparalleled collection of indoor and outdoor amenities spanning over 11,700 sq. ft. There’s a Social Room, complete with a chef’s kitchen and formal dining area, that opens onto a beautifully landscaped raised podium garden. This Terrace Garden at the Vancouver TATE on Howe condos spans 5,200 sq. ft. and includes a calming water feature and sheltered Courtyards. The Fireside Lounge and Library with over-height ceilings provide a cozy setting for reading and relaxation. Deluxe fitness facilities encompass a 2,100 sq. ft. Gym with state-of-the-art equipment, a relaxing Yoga Studio, plus spacious change rooms and showers. Take advantage of the Meeting Room and large Conference Room at TATE on Howe Vancouver South condos to impress clients and conduct business. If you like to socialize close to home, enjoy a casual evening with friends and neighbours in the Billiards Room, or entertain Hollywood-style with a private screening of the latest movies in the 12-seat surround sound centre. Having such luxurious amenities at your doorstep allows you to indulge in life’s daily pleasures. Please note that these are only draft prices for presales at Vancouver’s TATE on Howe condo tower and are subject to change at any time. They do not include taxes, strata fees or property taxes. 1 bedroom plus storage units around 479 square feet on the 4th floor start from $291,900 while Unit C1 layout at 465 sqft on floors 8 to 21 are priced from $299,900. Unit A2 TATE on Howe floor plan is a 1 bed plus storage that is 530 square feet on floors 8 to 21 and priced from $343,900. Floorplan D3 is a junior 2 bedroom plus enclosed balcony plus storage at 616 sqft on floors 8 through 21 and priced from $396,900. Floor plan M1 is a 2 bedroom plus storage at 789 sf and on floors 23 to 39 and is priced from $638,900. Pricing and availability are subject to change without notice. The Presentation Centre is almost ready for your visit! From Tate on Howe website: Vancouver Tate on Howe will be a defining project in Downtown Vancouver. Located in the Downtown South area, Tate on Howe is at the gateway of the downtown core, making it a premium location to access all of Vancouver. Tate on Howe is unique in its offering with an incredible collection of amenities: lobby lounge, library, theatre room, state-of-the-art gym, terrace garden, amenity dining and kitchen for entertaining, among others. Residents will enjoy the feeling of luxury every day as they enter through the Grand Lobby and Porte Cochere.